This article will describe improving boot time. 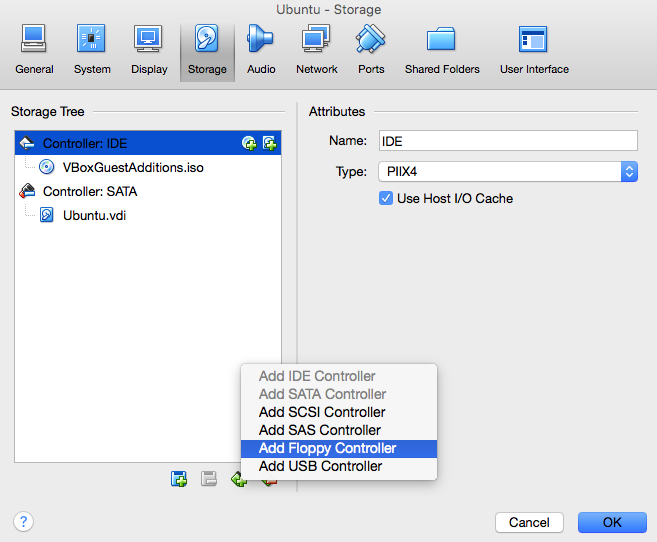 This article runs VirtualBox on OSX and use below spec. Ubuntu 16.04 is installed by ubuntu-16.04-desktop-amd64.iso and formatted by LVM + ext4. A boot time after installation is as below. BIOS timeout of VirtualBox is about 3 seconds by default. "Adjusting the VirtualBox F12 BIOS Boot Prompt Timeout" explains how to change BIOs timeout. Change the minimum 1 for improving boot time, change 3000 when you need BIOS operation. VirtualBox 5.0.20 r106931 may have a issue with bus for floppy. This issue is that bus controller always treats floppy be exists without adding floppy controller. Linux kernel will know floppy with probe function and run init function for floppy. The init function will be failed, sleep and try again, which will cause boot time delay. Add floppy controller for making init function to be succeed. Add floppy controller can be done when Ubuntu 16.04 is shutdowned. It decreased kernel boot time about 2 seconds. Activating LVM swap causes boot time delay. It decreased kernel boot time about 5 seconds. vboxadd-x11.service uses CPU power but does nothing. It decreased userland boot time about 1 second. The systemd runs parallel and it improves userlan boot time.